The station is actually a backdrop. A 5 1/2' long print was made from a photo of the Vancouver BC CP Rail terminal, cut out and glued to the wall. The fascades for under the white railing were drawn on the computer, printed and fitted under the BC terninal. 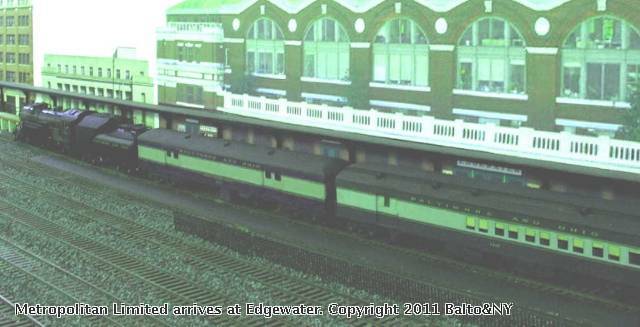 A removable, 11 1/2' long high-level platform was made in wood and styrene to fit into a slot in the benchwork in front of the station print. Other buildings in this scene are enlarged photo prints of the local 1930s WPA project post office and a brick office building from the 1910s. The baggage car is scratch built, the combine rebuilt from a 1940s Walthers 'junker' bought at a train show for $10. The loco is a Sunset B&O Q-4b, which did sometimes see passenger service on the B&O.